Highest quality outdoor vinyl double strip kit you can buy. 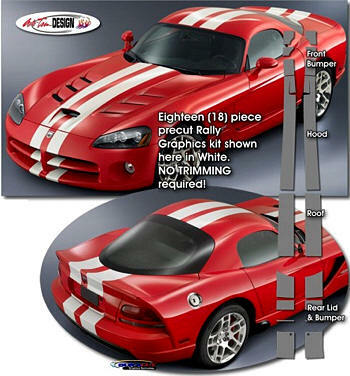 Make your '08-Current Dodge Viper "Tough-looking" with this awesome Rally Stripe Graphics kit. Professional installation only. Graphic kit is PRECUT and ready to install in a wide variety of colors - slight final trimming needed as required by professional installers. This stripe package is not just a box of straight strips. Our graphic kit consists of tapered, pre-fitted and contoured pieces as shown in the illustration - straight stripes will not work on this vehicle. Thus, due to the fact that this kit is created specifically for the '08-Current Dodge Viper it will not fit any other vehicle. 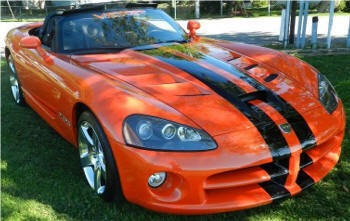 Stripes require center spacing at time of installation as per our detailed Parts List. Graphic package includes general online application and care instructions. Stripe width is approximately 5" in front and tapers to 9" in the back and set for a center space of approx. 3.5" varies slightly at time of installation. Stripe width is approximately 8" (20.32cm) and set for a center space of 4"
(101.60mm) at time of installation. Trimmable Spoiler Kit consists of two (2) pieces 16" (40.64cm) in length that can be trimmed during installation for custom spoiler applications. Includes six Vent decals that fade down towards the back side. Fade starts about 3/4's of the way from the front. Starts at 100% and fades to 20%. 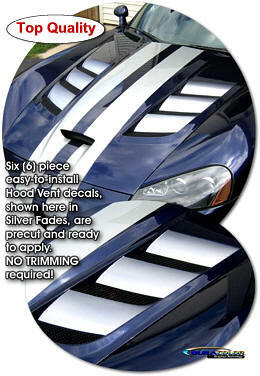 Highlight your '08-Current Dodge Viper's Hood Vents with these unique Vent Decals that start as solid at the front of each vent and fades to your vehicle's paint scheme to the rear as shown in the picture. Thermally printed onto clear premium automotive grade vinyl with our DuraCOLOR digital process, decal kit is available in four (4) fade colors. As an extra step, graphic pieces are over-laminated with a 2.5 mil clear laminate which will protect the graphics from miles of abuse. Hood Vent Decals are precut and fit perfectly - Professional installation only. Graphic kit is PRECUT and ready to install in a wide variety of colors - slight final trimming needed as required by professional installers. Center dual rally stripes are not included in this kit sold separately. 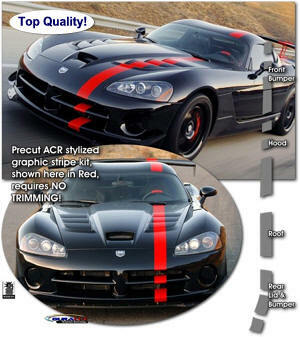 Make your '08-Current Dodge Viper Coupe "Tough-looking" with this awesome ACR stylized Graphic Stripe kit. NOTE: Includes piece for spoiler. Spoiler wing support arm would have to be painted red by customer for this look.